This review is for 'mr&mrs' from FlyerTalk. He/she originally asked if I had tried the Chicken McPepper in Singapore, but seeing as I make it to Hong Kong far more often, I have only been able to try the McPepper in Hong Kong, and it uses a beef patty. The McPepper is a promotional item that McDonald's HK brings back about once every two years. I originally sampled it in November of 2009, but I do not know when it was first introduced. 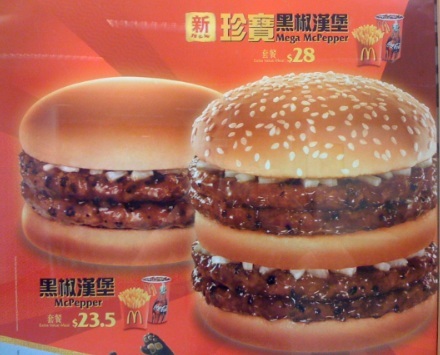 They brought it back in October 2011, and it this time, they had the 'Mega McPepper' (which you can see in the photo above). The burger itself its pretty simple, a double hamburger, but smothered in a black pepper gravy and topped with cooked onions. But they had so much sauce on it, that I was able to scrape some off to dip my fries in it and still have enough on the burger to enjoy the taste (and it was a great topping for the fries!) Personally, I didn't find it 'spicy' at all (but then again, people think my taste buds are damaged, as nothing is ever 'spicy'), but the black pepper taste was wonderful, I enjoyed it, and if they had it is a main menu item, I would easily order it over anything else. I wish I made it back to HKG in time to try the 'Mega' edition, but I feel that might be a sauce/sodium overload. As is everything in Hong Kong McD's, it was a great value just 23$ for the combo. Cheers for that. Still finding my groove. All these are items I have tried in the past, but I have some upcoming trips where I can do reviews on the road as I sample, and they should be a bit more informative and in depth.